These earrings are so comfortable that you will not want to take them off. In addition, the design will earn you loads of compliments. 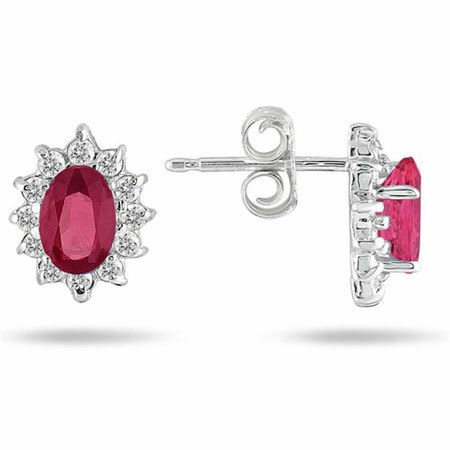 What makes this pair of earrings so special is the use of Ruby. The red tone in the floral design's center was given by the Ruby. Around this 6X4mm Oval gemstone are a lot of small Diamonds. Together, these form a beautiful flower-like arrangement on the 10K White Gold plate. The diamonds would not weigh more than 0.24 CWT and the weight of the earring is not much either. You can wear this durable accessory for years. The unique design is timeless too. It would never go out of style. The simple accessory can be adorned every day. You could also keep it in your collection and wear it to a date or a party. We guarantee our Real Ruby and Diamond Flower Earrings to be high quality, authentic jewelry, as described above.